The information on the early generations is taken from The Lawrence Family by Robert M. Lawrence, MD published in Boston 1888 & The Genealogy of the Family of John Lawrence by Rev. John Lawrence published in Boston 1869. JOHN5 LAWRENCE, d. of Ashton Hall. SIR ROBERT7 LAWRENCE, d. of Ashton Hall. SIR ROBERT8 LAWRENCE, d. of Ashton Hall. NICHOLAS LAWRENCE, d. of Agercroft. 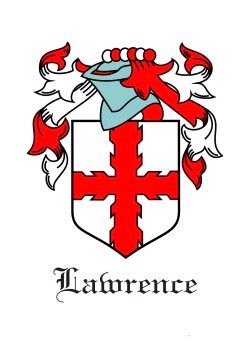 JOHN LAWRENCE, b. of Agercroft; d. 1461, Suffolk, England. THOMAS11 LAWRENCE, d. 1471, of Rumburgh in Suffolk, England. JOHN12 LAWRENCE, d. 1504, of Rivenburg. RICHARD LAWRENCE, d. of St. Ives. JOHN14 LAWRENCE, d. Aft. 1556, of Rumburgh in Suffolk, England. JOHN LAWRENCE, d. 1590, Rumburgh, England. RICHARD LAWRENCE, d. of Wisset, England. JOHN16 LAWRENCE, d. 1607, of Wisset in Suffolk, England. HENRY17 LAWRENCE, b. April 10, 1586, Wisset, Suffolk, England; d. 1664, Charlestown, Massachusetts. JOHN18 LAWRENCE, b. 1609, Wisset, County Suffolk, England; d. July 11, 1667, Groton, Massachusetts. JOHN18 LAWRENCE (HENRY17, JOHN16, JOHN15, JOHN14, ROBERT13, JOHN12, THOMAS11, JOHN10, NICHOLAS9, SIR ROBERT8, SIR ROBERT7, JOHN6, JOHN5, JAMES4, SIR ROBERT3, SIR ROBERT2, SIR ROBERT1) born 1609 in Wisset, County Suffolk, England, and died July 11, 1667 in Groton, Massachusetts. He married (1) ELIZABETH ?WATERS 1635 in Groton, Massachusetts, daughter of ?JAMES WATERS and ?PHEBE MANNING. She died August 29, 1663 in Groton, Massachusetts. He married (2) SUSANNA BATCHELOR November 02, 1664, daughter of WILLIAM BATCHELOR. She died July 08, 1668 in Charlestown, Massachusetts. JOHN19 LAWRENCE, b. March 14, 1635/36; d. 1670; m. (1) SUSANNA; m. (2) SARAH BUCKMINISTER, September 30, 1657. NATHANIEL LAWRENCE, b. October 15, 1639; d. April 14, 1724; m. SARAH MORSE, March 13, 1659/60, Sudbury, MA. JOSEPH LAWRENCE, b. March 1641/42; d. May 1642. JOSEPH LAWRENCE, b. May 30, 1643. JONATHAN LAWRENCE, b. Watertown, Massachusettes; d. Bet. 1725 - 1729, Groton, Massachusetts; m. REBECCA RUTTER, November 05, 1677. MARY LAWRENCE, b. July 16, 1645; d. February 10, 1685/86; m. INIGO POTTER, August 25, 1663. PELEG LAWRENCE, b. January 10, 1646/47; d. February 14, 1691/92, Groton, Massachusetts; m. ELIZABETH MORSE, December 22, 1668; b. September 01, 1647. ENOCH LAWRENCE, b. March 05, 1648/49, Watertown, Mass; d. September 28, 1744, Groton, Massachusetts. SAMUEL LAWRENCE, b. 1650; d. Connecticut; m. REBECCA LUEN, September 14, 1682. ISAAC LAWRENCE, b. 1652; m. ABIGAIL BELLOWS, April 19, 1683; b. 1661, Concord, Mass. ELIZABETH LAWRENCE, b. May 09, 1655, Boston, Massachusetts; d. February 02, 1741/42; m. THOMAS WHITNEY, January 29, 1676/77. ZECHARIAH LAWRENCE, b. March 09, 1658/59, Watertown, Massachusettes; d. Boston, Massachusetts. ABIGAIL18 LAWRENCE, b. January 09, 1665/66, Groton, Massachusetts. SUSANNAH LAWRENCE, b. July 03, 1667, Groton, Massachusetts. REBECCA20 LAWRENCE, b. Bet. 1679 - 1680, Boston, Massachusetts. NATHANIEL20 LAWRENCE, b. February 21, 1677/78, Watertown, Massachusetts; d. September 13, 1765, Groton, Massachusetts. DANIEL LAWRENCE, b. March 07, 1680/81, Groton, Massachusetts; d. December 02, 1793, Plainfield, Connecticut; m. SARAH. ZECHARIAH LAWRENCE, b. July 16, 1683, Groton, Massachusetts; Lawrence, Zechariah m. ABIGAIL PARKER, 1707. JEREMIAH LAWRENCE, b. May 01, 1686, Groton, Massachusetts. NATHANIEL21 LAWRENCE, b. May 31, 1702, Groton, Massachusetts; d. 1775; m. DOROTHY CHAMBERLAIN, February 04, 1728/29. JAMES LAWRENCE, b. August 26, 1705, Groton, Massachusetts; d. January 27, 1800; m. MARY MARTIN, February 20, 1732/33. ANNA LAWRENCE, b. July 03, 1708, Groton, Massachusetts; m. SAMUEL WRIGHT, January 18, 1732/33. ENOCH LAWRENCE, b. November 15, 1710, Groton, Massachusetts; d. Mason, New Hampshire; m. SARAH STEVENS, January 29, 1733/34. SARAH LAWRENCE, b. March 15, 1712/13, Groton, Massachusetts; d. July 24, 1797; m. ZECHARIAH LAWRENCE, December 05, 1734. MARTHA LAWRENCE, b. December 07, 1715, Groton, Massachusetts; m. WILLIAM BLOOD, February 11, 1735/36; b. Groton, Massachusetts. JOSEPH LAWRENCE, b. April 10, 1718, Groton, Massachusetts; d. 1757, Pepperell, Massachusetts. BENJAMIN LAWRENCE, b. November 06, 1720, Groton, Massachusetts; d. July 05, 1807; m. REBECCA DODGE, June 20, 1744. REBECCA LAWRENCE, b. April 17, 1724, Groton, Massachusetts. LOIS LAWRENCE, b. September 26, 1726, Groton, Massachusetts; m. BEZALEIL SAWYER, December 17, 1751. EUNICE LAWRENCE, b. July 25, 1728, Groton, Massachusetts; d. November 15, 1747. ELIZABETH22 LAWRENCE, b. October 11, 1739, Groton, Massachusetts; m. WHITCOMB POWERS, October 18, 1759. ZERUIAH LAWRENCE, b. March 23, 1741/42, Groton, Massachusetts; m. JOSEPH NUTTING, September 02, 1767. ANNA LAWRENCE, b. December 06, 1743, Groton, Massachusetts; m. THOMAS PRATT; b. of Dunstable. LUCY LAWRENCE, b. May 07, 1747, Groton, Massachusetts; d. November 11, 1817, Jaffrey, Cheshire, New Hampshire. JOSEPH LAWRENCE, b. April 06, 1749, Pepperell District of Groton, Massachusetts; d. January 05, 1825, Pepperell District of Groton, Massachusetts. MARTIN LAWRENCE, b. May 17, 1751, Groton, Massachusetts; d. 1823, Swanzey, New Hampshire; m. SARAH PUFFER. JOSHUA LAWRENCE, b. April 18, 1753, Groton, Massachusetts; d. May 29, 1827; m. RUTH NIMS, 1780. SARAH LAWRENCE, b. September 14, 1756, Groton, Massachusetts; m. SAMUEL T. WOODBURY; b. of Beverly, Massachusetts. LUCY22 LAWRENCE (JOSEPH21, NATHANIEL20, ENOCH19, JOHN18, HENRY17, JOHN16, JOHN15, JOHN14, ROBERT13, JOHN12, THOMAS11, JOHN10, NICHOLAS9, SIR ROBERT8, SIR ROBERT7, JOHN6, JOHN5, JAMES4, SIR ROBERT3, SIR ROBERT2, SIR ROBERT1) born May 07, 1747 in Groton, Massachusetts, and died November 11, 1817 in Jaffrey, Cheshire, New Hampshire. She married JOHN BRYANT I, son of KENDALL BRYANT and MARY MARTIN. He was born July 14, 1750 in Pepperell, Worchester, Mass, and died March 14, 1800 in Jaffrey, Cheshire, New Hampshire. This line continues on the BRYANT family page. JOSEPH22 LAWRENCE, b. February 15, 1773, Pepperell, Massachusetts; m. LUCY FARWELL. LYDIA LAWRENCE, b. March 09, 1775, Pepperell, Massachusetts; m. EZRA BLOOD, April 06, 1796; b. of Townsend, Massachusetts. PHEBE LAWRENCE, b. March 16, 1777, Pepperell, Massachusetts; d. 1851, Athens, Vermont; m. GEORGE PERHAM. EUNICE LAWRENCE, b. July 16, 1780, Pepperell, Massachusetts; m. GEORGE W. WRIGHT. SYBIL LAWRENCE, b. July 16, 1782, Pepperell, Massachusetts; m. ISAAC BOYNTON. ABRAHAM LAWRENCE, b. April 19, 1784, Pepperell, Massachusetts; d. July 14, 1806. ABIJAH LAWRENCE, b. February 25, 1786, Pepperell, Massachusetts; d. February 27, 1808. LEVI LAWRENCE, b. April 25, 1788, Pepperell, Massachusetts; d. April 11, 1816; m. CLARISSA STEARNS. JOSHUA LAWRENCE, b. February 03, 1790, Pepperell, Massachusetts; d. March 1812. BRYANT LAWRENCE, b. April 22, 1795, Pepperell, Massachusetts; d. April 18, 1822; m. OLIVE SHATTUCK.